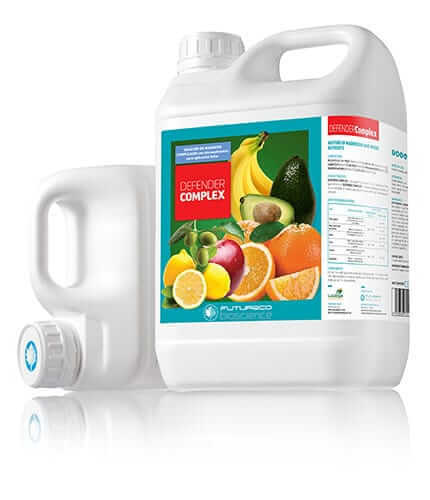 Defender Complex - Kenya Biologics Ltd.
DEFENDER COMPLEX may be applied by irrigation or directly on the plant. The recommended doses of the table are indicative and correspond to studies conducted under certain climatic, soil and water conditions, so that dose adjustment is recommended based on the user experience. In case of doubt, consult a qualified service technician, the technical department of FUTURECO BIOSCIENCE or your dealer. DEFENDER COMPLEX is stable for at least three years since manufacturing date. Store in the closed original container in a cool and ventilated area. DO NOT store for prolonged periods in direct sunlight. Keep away from food, drink and animal feed. Keep out of the reach of children. Use only in case of recognized need and don’t exceed the recommended doses. Apply 2-3 times throughout the cycle. Apply 3 times throughout the cycle. Apply 4 times throughout the cycle. Apply 2 times during vegetative growth. Apply 3 times applications throughout the cycle.